Today's a really exciting day. 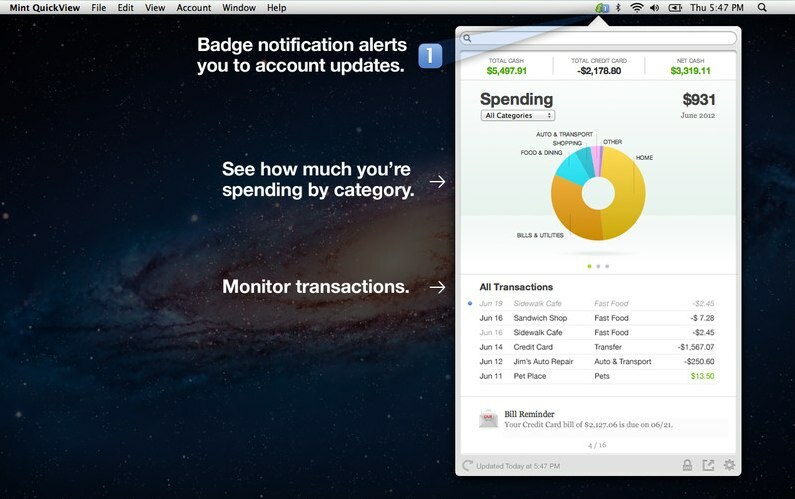 My team at Intuit just launched our first app called Mint QuickView for Macintosh. This is a huge milestone for us because we're all new to the company and one hasn't really earned their stripes until they ship something. Click here to download it. What is Mint QuickView? Mint QuickView is a companion app to the Mint.com website that works on your Mac and provides you a snapshot of what's going on with your personal finances. It updates through out the day and lets you know when something new hits your account. There are also handy little charts that let you see your spending, net income and account balances. If you like to keep tabs on your money, this is the app for you. For those of you who aren't familiar with Mint...Mint.com is a free website that aggregates all of your checking, savings, credit card, loan, investments and property accounts in one site to allow you to track and analyze your personal finances. We also have an iPhone, iPad, Android Phone and Android Tablet app which are pretty cool. A number of friends of mine have expressed concern about entering their financial account information into the Mint.com website and I totally get that. I was the same way until I wanted to interview at Mint and thought I better use the product before I chat with them. The bottom line is that the security is really really tight and to me the benefit out ranks the risk. I have gained a lot by using Mint. There's a lot of incite and benefit you receive from having all of your accounts in an easy to track location and it's been tremendously helpful. First off my wife loves the iPad app and she now actually reviews our finances daily. She never looked at it before. Also because we're both looking at this stuff all the time, we actually spend less money because we know the other will spot it instantly. Finally, I've seen things that I didn't know were occurring in my account like little fees that Fidelity was charging me because I owned a foreign stock. Suffice it to say that I'm now a believer in Mint and will be a customer for life. Sorry, I'm not trying to sell it because I work there but I've been really happy with how it's helped me get my personal finances in order. Also, did I mention it's free? 1) Two Finger Swipable - I'm guessing that's not a real word but QuickView is designed to work with your trackpad. When your mouse is over the charts use two finger to swipe left and right on your trackpad and you'll get new charts. you can also use CMD+1, CMD+2, and CMD+3 to go directly to the spending, net income and account charts. 2) Hit space bar in the search field to grow the transaction list - The official way to grow the transaction list is to click on the See More button below the transaction but if that's too much work just add a space in the search field and the list will grow tall and you'll see more of your transactions and you'll get a total. 3) Search for tags, notes and most anything in a transaction - Speaking of search, there's nowhere in the product that tells you what we search on. Well we search on practically everything in a transaction so go for it. We even search on the notes field which even the mint.com site doesn't do. We like to rub salt in their wounds on that one. 4) Don't like charts, hide them - When we were building QuickView we had some pretty vocal people internally who hated the charts and felt they took up too much space that would be better served by the transaction list. Well they are probably right but I like charts and think long lists of text is boring. But if you are one of those that also hates the charts, you can run QuickView without ever seeing them. Simply click on See More and leave it up. QuickView will remember this state. You can still swipe to different sections and then use the drop down list to filter the transaction list all without having to see a chart. 5) Don't like menu apps, snap QuickView off of the menu bar - We also heard loud and clear from beta customers that some of them don't like menu bar apps. Gee it's like religion or something to people. Some love them and some hate them. Well we built QuickView for everyone. Just go to preferences under the Gear menu and uncheck "Attach window to menu bar". Now you'll be able to leave QuickView up all the time and drag it around even to a second monitor. 6) Passcode protect your personal finances - One of the first things we added to QuickView when we were building the app was a passcode feature. Primarily because we're all running QuickView in the office and who wants to leave it available to anyone to just walk by your desk and find out how terribly poor you are. By the way, we call it a passcode but it can have numbers, letters, special characters and be any length you want. It's really a password but we didn't want to confuse people with the password that lets you see your QuickView data and the password to login to your Mint account. To set the passcode, just click on the lock icon in the bottom right corner. Once set you can use the lock icon to immediately put QuickView into passcode mode. 7) Edit your transactions - We think one of the first feature requests people will have is to be able to edit their transaction from within QuickView especially when you see that uncategorized transaction appear. We didn't add it to this first release but we do know it's important. Just right click on the transaction you want to edit and click on the Edit This Transaction... menu item. This will bring up the mint.com site and will find the current transaction to allow you to edit it. 8) Find out what the heck this transaction is - As you may guess, we've been using QuickView internally for the past 6 months and have had quite a few of our own feature requests. One of the things we've noticed with our own accounts is that there are times you have no idea what a particular transaction is. There are a few things you can do. First off there are tooltips for the transactions so just hover over a transaction and the tooltip will tell you the actual bank name for a particular transaction and this is sometimes really helpful. Mint does a pretty good job of translating these things but sometimes it does a really bad job and so you want to double check the actual name from the bank. Second, if you right click on a transaction you can use the Search with Google feature. This simply uses the merchant name and tries to search for it using your default search provider. Sometimes this can help you identify a strange merchant name. Third, I think this is the coolest feature, right click on the transaction and select Send This Transaction. This will bring up your email an dump a bunch of transaction information into an email so you can send it to your spouse to ask him or her what the heck a particular transaction is. 9) Export Transactions as CSV - As you may have noticed, we have a lot of things hidden on our right click menus. Here's another one. If you filter the transaction list or simply want all of your transactions to export to Excel, right click on the transaction list and select Export Transactions. This will export the current list of transactions into the CSV format which you can then import into Excel or another personal finance application. 10) Change the sort order of Transactions - Another hidden feature is the ability to change the sort order of the transactions. You change sort by date, merchant, category or amount. Just make sure you select Reset to Default Sort to get everything back to normal. As many of my software colleagues, I'm a little...how do we say it...robust, big boned, a little on the bigger side. OK, I admit it I'm kind of fat. What makes it worst is that I'm short and fat so it's really quite an attractive sight. In any case, I may be shrinking soon. I just purchased the Fitbit Ultra and the Fitbit Aria Scale. The Fit Bit Ultra is a cool gadget that fits in your pocket and records your steps, calories burned, activity, flights of stairs, miles walk and sleep. The Aria Scale does what you expect. It measures your weight and % Body Fat but the cool thing is that it updates your stats wirelessly over WiFi. I know what you're thinking. You dummy you can buy analog tools that do exactly the same thing at less than half the price and I know thats all true but I still love my Fitbit. The problem is I had some of those pedometers and other gadgets but none of them had a cool website where all of this data is collected. Fitbit is a start-up in San Francisco and they went to the Steve Jobs school of product development and realized that it's the entire end-to-end experience that matters and not just the individual components of the system. Sure other products can log your steps but not all of them have a great website where all of this information is stored. And more importantly, not all of them have the tracking, goal setting and goal keeping tools that Fitbit does. Plus the fitbit gadgets update the website wirelessly and in a hassle free manner. The Fitbit Ultra has a base station that can communicate wirelessly to the fitbit so if you're 15 feet from your base station then the stats from your fitbit will automatically get updated to the website. A number of people at work have bought the Nike FuelBand product which is very cool as well and they like it. I decided to go with the fitbit because it said it tracks your sleep and also measures going up and down stairs which it does. I actually use both of these quite a bit since I have stairs in my house and I do sleep. However, what I learned via my fitbit is that I don't sleep enough. To measure sleep you attach the fitbit to an wrist band. There is a little hole in it where you put the fitbit. You hold down the fitbit button and it starts timing your sleep. When you wake up, just hold down the button again and it will stop. It measures how well you sleep and how often you wake up. I'm not sure it's accurate enough to be used for Sleep Apnea studies but I can tell you that the days that fitbit tells me I slept crappy are the days I feel really tired so it's accurate from that perspective. The best thing about fitbit is that it has actually made me care about the calories I eat and the exercise I get each day to offset those calories. I now track all the calories I eat each day religiously. Fitbit has a food logging module but it's not very good. I just started using My Fitness Pal on my iPhone and iPad to log in my daily caloric intake. The best thing about My Fitness Pal is that it has a lot of the food you eat built in to it's database. Including popular menu items at lot of the fast food and big chain restaurants so you can quickly get calories for when you eat out and we eat out a lot so that's a pretty important feature. Even cooler is that you can take a photo of the bar code for packaged goods in your home and My Fitness Pal will automatically input the calories, sodium and fat content into the system. I tried 5 different things in my house and the bar code worked every time from Organic Cut Baby Carrots to the Rotisserie Chicken we bought at Whole Foods. Very cool. It's been a few weeks of use and I'm still doing stupid things like watching TV Shows on my iPad and walking around the dining room table just so I can up my step count. Absolutely weird to watch but it works! I'm on the easy plan to lose 20 pounds so I don't have to starve myself but I've already lost 3 pounds. In conclusion, it may have cost me a pretty penny to buy these gadgets but possibly because they are electronic toys that connect to the Internet, I'm totally focused on hitting my step and activity scores to earn badges and hopefully to eventually lose some weight. It's worth every penny.